Source: Based on the character "Charlie Chan" created by Earl Derr Biggers. 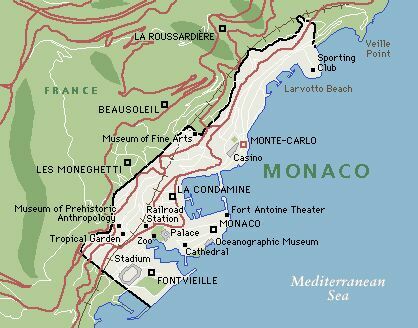 Charlie Chan and number one son Lee are passing through Monte Carlo on their way to Paris for an art show in which Lee has a painting. While there, they meet Inspector Jules Joubert, chief of police of Monte Carlo. That evening, as father and son leave to catch the train from Nice, their taxi breaks down. Chan and Lee continue on foot until they see an expensive roadster speed past them, leaving another car in which the two find a dead man. Two gendarmes arriving at the scene misunderstand Lee's poor French, and understand him to say that they were responsible for the man's murder. Back in Monte Carlo, after Chan and Lee are released by authorities, an investigation reveals that the dead man was Renault, a bank messenger who was on his way to Paris with $1,000,000 in metallurgic bonds, now missing, which belonged to Victor Karnoff. It is also discovered that three metallurgic bonds were offered for sale that same day at a Monte Carlo bank by Al Rogers, a bartender at the Hotel Imperiale. Later, Chan and Lee recognize the expensive roadster in front of the hotel and learns that it belongs to Evelyn Grey, who is a resident there. Inspector Joubert and Chan find her in the company of Paul Savarin, a stockbroker and Karnoff's bitter rival. Although she admits stopping by the car, Evelyn says that she had fled in fright when she had seen Chan and Lee approach, figuring them to be the murderers. Joubert learns that Karnoff's chauffeur Ludwig, who had driven Renault, was in league with Savarin. Originally suspecting that Ludwig had committed the crime, Joubert soon learns that the driver's body has been found in a swamp near the car. The next day, Karnoff's wife Joan, who had, the night before, begged Rogers to give her back the three bonds that she had previously given to him, admits to him that she had stolen them from his room. Rogers then gives her until noon to repay him their value of $25,000. At breakfast that morning, Evelyn promises Gordon Chase, Karnoff's secretary who is in love with her, that she will not see Savarin again and that Savarin means nothing to her. After Chan learns that Evelyn has been living in luxury with no visible means of support, and that Joan Karnoff had pawned jewelry that morning for $25,000, the value of the three missing bonds, he and Joubert go to interrogate Rogers. However, upon arriving at his room, they find him dead with an open valise full of Karnoff's stolen bonds. Joubert concludes that Rogers had committed suicide, and that the case is closed, but Chan suggests that the evidence shows otherwise. Chan and Joubert go to see Karnoff at his house where they also find Joan, Savarin, Gordon, and Evelyn. Joan confesses that Rogers, whom she had married seven years earlier, and whom she had thought had obtained a divorce, was blackmailing her. As a result, she had given him the three bonds, but had stolen them back when she had learned of Karnoff's million-dollar deal from her brother, Gordon, who secretly replaced them for her. Chan has Lee bring in the valise containing the bonds only to find that it is locked. Asking Karnoff for the key, Gordon supplies it and opens the lock. 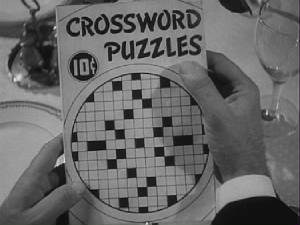 Chan then announces that Gordon Chase is the murderer, as the valise had been found open with no damage to its lock in Rogers' room, and the only keys to it were in the possession of the messenger, Renault, and Karnoff's secretary, Gordon. Other facts seal the case against Gordon who confesses to the crimes, berating Evelyn Grey for whom he had stolen from Karnoff so that she could live a rich lifestyle. When Gordon had felt he was in danger of being exposed, he had killed Rogers, attempting to make it look as if he had commited the crimes. Gordon, swearing revenge against Evelyn, flees through an open window, but is run over and instantly killed by a speeding car. Joubert "suggests" that Evelyn and Savarin leave Monte Carlo. With the case successfully concluded, Inspecter Joubert gives Charlie Chan and Lee another send-off as they haltingly depart in the same backfiring taxi that had broken down earlier. NOTE: Charlie Chan at Monte Carlo was Warner Oland's last film. Oland began work on Charlie Chan at the Ringside in January of 1938, but the production was halted when the actor walked off the set on the 17th of that month. According to news items, there was a dispute between Oland and the studio. Humble presence of no more importance than one drop of rain in cloudburst. Illustrious ancestor once say, "Destination never reached by turning back on same." Action speak louder than French. Tongue often hang man quicker than rope. One picture still worth ten thousand words. Questions are keys to door of truth. Car with new sparkplug like flea on puppy dog - make both most active. (Lee: "Gosh, Pop, I haven't a cent in my pocket.") Rejoice that you still have honorable pants. (Lee: "I like detective work better than painting.") If paintings as full of imagination as detective work, he will be Chinese Rembrandt. (Lee: "There's another car down there, Pop! Must have been an accident.") Perhaps like our own taxi - on sit-down strike. Perhaps Hollywood's nearest approach to achieving perpetual motion is the regularity with which 'Charlie Chan' cop-chase-crook mellers are milled out. 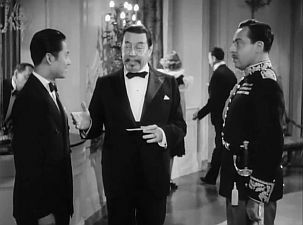 Finding the Chinese detective 'at Monte Carlo' also finds Warner Oland in his 16th feature as Chan in the last six years. Pic, obviously aimed at the duals, should be o.k. on popularity already built up and streamlined. But it's a bit under average for Chan celluloiders. Culprit who commits the murders is very well concealed; in fact, too well. 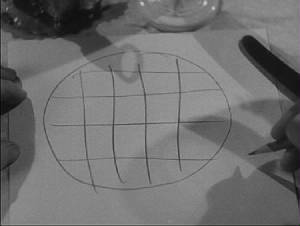 Not enough clues are strewn about for the audience to have any chance of nailing the one in advance through deduction. That's rather unfair and weakens the effect of the pic as a whole. 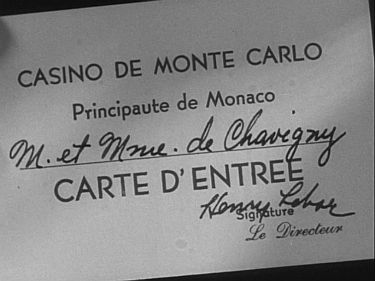 Plot finds 'Chan' passing through Monaco for a gander at the gambling casino. He is detained at departure when his taxi breaks down and he discovers a murder and a theft of $1,000,000 worth of bonds. The usual several adjunctive murders follow. Suspects include almost all the cast characters, but motives for the crimes are too vaguely established and the progression of plot moves too haltingly. 'Chan' seems to be running out of bon mots derived from 'Old Chinese proverbs' to sum up situations. His 25-year-old son (Keye Luke) supplies rather lightweight humor by his bumbling when trying to independently track down the villain. Harold Huber is swell source of humor as a gesticulating, apologetic chief of Monaco's police. It's an abrupt departure from the heavy characterizations which Huber has always done in the past, and reveals him as an actor with more facets than suspected. There's no real romantic side to the yarn, which proves something of an oversight, in view of the general plot weaknesses. Also poor judgment was having so much dialog couched in French, whole scenes thus being negated for Yankee audiences. Rest of the cast about o.k., with Sidney Blackmer and Edward Raquello in good form as smoothies. In a bit, Louis Mercier scores as a muttering, clog-craniumed hack driver. Direction might have speeded the yarn more; camera didn't set the film off too well. The Chans' hotel room in Nice is number 125. Lee is 25 years old. The date is August 25. It is the Chinese year 9325. Charlie Chan: "25 is also amount you borrow from me last week." THE AMOUNT OF TIME THAT JOAN KARNOFF HAD TO GET THE MISSING METALLURGIC BONDS TO HER BROTHER GORDON CHASE: "About an hour." ACCORDING TO LEE CHAN, THE REASON THAT HE AND HIS POP WERE ON THEIR WAY TO PARIS: "I'm exhibiting a painting at the Paris Exhibition, and we've got to be there for the showing." THE DRINK ORDERED BY THE COUPLE AT THE BAR: "Cocktail de Bronx"
"Series G - 18407 to 17." "J - 2264 to 74." "R - 9183 to 93." THE CASES IN JULES JOUBERT'S DESK, MENTIONED BY JOUBERT TO CHARLIE CHAN: "Mlle. Fifi Zaza report the loss of puppy dog...A doctor has the watch stolen...A bartender attempts the sale of some bonds and the bank lift the eyebrows." THE TIME AS EVELYN GREY LEFT THE CASINO TO TAKE "AN HOUR'S DRIVE" ON THE ROAD TO NICE: 10 p.m. THE TIME OF EVELYN GREY'S SCHEDULED APPOINTMENT WITH GORDON CHASE AT THE CASINO: 11 p.m. THE TIME AS PAUL SAVARIN TELEPHONED TO CHARTER AN AIRPLANE TO FLY FROM NICE TO PARIS: 8 p.m. THE TIME AS PAUL SAVARIN CALLED THE AIRPORT AT NICE TO CANCEL HIS CHARTERED PLANE: 9:30 p.m.
PAUL SAVARIN'S ORDERS FOR THE STOCKS HE SOLD OVER THE TELEPHONE: "...Sell them (unknown stocks) in 10,000 share lots. 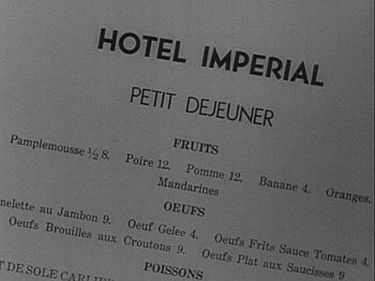 And offer 5,000 Burma Timber..."
EVELYN GREY'S ORDER AT THE HOTEL IMPERIAL BAR: "...something strong." THE POLICE INFORMATION ON EVELYN GREY AS TRANSLATED TO CHARLIE CHAN BY JULES JOUBERT: "Age 24; born in London; unmarried; occupation: mannequin. Left position in April. Since then, living expensively in Monte Carlo with invisible income." THE POLICE INFORMATION ON AL ROGERS AS TRANSLATED TO CHARLIE CHAN BY JULES JOUBERT: "Age 35; born in Chicago; arrested twice for petty larceny - no conviction. Occupation: Vaudeville dancer. Appeared in French music halls in 1936. Since employed as bartender in Vichy and Monte Carlo." ACCORDING TO JULES JOUBERT, THE TIME AS JOAN KARNOFF BROUGHT JEWELRY TO A PAWN SHOP IN NICE: "...at eight o'clock this morning." ACCORDING TO JULES JOUBERT, THE LENGTH OF TIME SINCE THE LAST MURDER IN MONTE CARLO: "...25 years..."
ACCORDING TO JULES JOUBERT, THE APPROXIMATE TIME OF AL ROGERS' MURDER: "...between ten and eleven (a.m.)." all in - (Idiom) Very tired; exhausted. Charlie Chan at Monte Carlo - Evely Grey: "I'm all in with that session with the police last night." asbestos - A fireproof fabric woven from asbestos fibers, formerly used for theater curtains, firefighters' gloves, etc. Charlie Chan at Monte Carlo - Charlie Chan: "Next time must buy asbestos pants." Jules Joubert: "They are the enemies on the Bourse as well as in the casino." chemin de fer - (French) The French version of baccarat, chemin de fer is a casino game in which players bet on either of two hands dealt on the table: the "player" or the "banker." The hand that comes closer to 9 wins. Jules Joubert: "Cherchez la femme - always at the bottom of trouble is a woman." A "Cocktail de Bronx" was ordered by a couple at the bar in the Hotel Imperial. Lee Chan: "It's what the French newspapers call a crime passionelle." Charlie Chan: "Venerable grandparent once have large holdings in fan-tan house." garçon - (French) A waiter or attendant. Joan Karnoff: "Garçon, my wraps, please." Charlie Chan at Monte Carlo - Joan Karnoff: "You know I was in a jam." Gordon Chase: "$25,000 of the metallurgic bonds are missing." Rembrandt - (Rembrandt van Ryn) (1606-1669) A very influential Dutch painter of the 17th century. Charlie Chan at Monte Carlo - Charlie Chan: "...he will be Chinese Rembrandt." sit-down strike - A strike in which workers refuse to leave the workplace until a settlement is reached. This form of protest was very much in the news during the mid-1930s. Charlie Chan: "Perhaps like own taxi, on sit-down strike." Vichy - A small city in central France southeast of Paris noted for its spa and hot mineral springs. During the German occupation from 1940-1944 this city was the capital of "free France." Jules Joubert: "Since employed as bartender in Vichy and Monte Carlo."